Honesty is the best policy… I had no intention of reading this book. The title made me wince, for heaven’s sake. But you know what? Dan Dos Santos’ cover art is AWESOME. I passed the book the first time in the bookstore and had to stop to take it all in, read the back cover. I didn’t buy it that trip, but the second time I couldn’t resist. I ask you to please, please judge this book by its cover (and not the title). It was wicked fun and irreverent and better even than the zombie chick’s pink hair. Angel is a loser, and she knows it. She’s not proud of her life – in fact, she’s pretty disgusted with herself. Well, that is until she wakes up in the hospital with a fragmented memory and a really strange craving for human brains. What the heck happened to Angel, and who is responsible for a rash of murders around the county? My Life as a White Trash Zombie reads as part paranormal mystery, part CSI investigation, and part wise-cracking journey to personal growth, with a dash of romance and general uncertainty thrown in. Did I mention that it was hilarious? And that Angel, despite her many faults, is pretty wise? Also: that a certain police officer is hot? Well, it’s all true. Angel is a complex character. Based on her history of bad decisions and choices made throughout the book, I thought it would be tough to love her (I can’t abide stupid). But Angel, as it turns out, is self-aware and intelligent, and she’s fed up with what she’s made of her life. She discovers a deep will to live, and she’s determined not to let her second chance evaporate. Setting and secondary characters also help Angel shine. The rural county she hails from, her decrepit house, the trailer her sometime-ex-boyfriend lives in, and even the morgue – are vivid scenery for the shenanigans and craziness that make up her everyday existence. Add in sympathetic coworkers, an aversion to cops (even though she works for them! ), and some kooky citizens and murders, and you get the recipe for one of the most entertaining zombie books I’ve had the pleasure of reading. Have I convinced you to pick this book up? It’s adult or mature teen fare (see above references to drugs, violence, etc. ), it’s zombies with a humorous bite, and it’s definitely more-enjoyable-than-expected. Shall I show you the cover art again? Well, that should settle it. 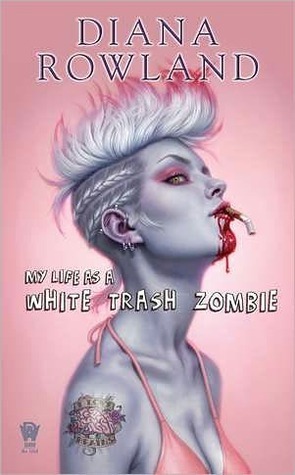 I read My Life as a White Trash Zombie as part of the September Zombies event. Goodness, what an unfortunate title! But you're right - the cover is made of awesome. Will have to look for this one at the library! I'm really into this cover as well. And I really love zombie books, so I'm definitely planning to read this one.